Geronimo, OK — After serving three tours in Iraq and Afghanistan, Kristoffer Lewandowski was medically and honorably discharged from the Marine Corps. After fighting the state’s wars for them, however, the state has taken it upon themselves to wage a personal war against him — for naturally treating an illness — he acquired fighting for them. Lewandowski is now a 100% disabled veteran because of the severity of his PTSD. Since he has gotten out, the VA had him taking up to 18 pills a day to treat his PTSD. This pharmaceutical treatment was literally killing him. At 180 Percocet per month, for ten consecutive months, along with a prescription for OxyContin, Lewandowski’s liver was failing. Luckily, for this Marine veteran, he found cannabis — and it worked. Cannabis treats PTSD so effectively — as both clinical and anecdotal evidence has shown — the Drug Enforcement Agency recently approved the first-ever study of its whole-plant medicinal use for vets in April. By allowing the use of the whole cannabis plant, the DEA opened the door for even the smoked variety to be studied for the potential alleviation of PTSD symptoms. 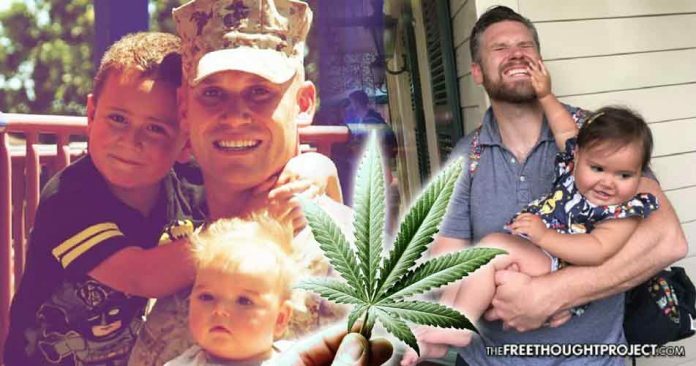 Unfortunately indicative of the government’s misplaced, draconian priorities, the continued federal prohibition of cannabis has created tragic and heartbreaking consequences for vets using the plant to treat PTSD — and Lewandowski is a living example of the state’s tyranny. After realizing that the meds were killing his liver, Lewandowski decided that it would be a good idea try marijuana as a treatment. He began growing 6 plants for his personal use. In June of 2014, Lewandowski had a PTSD episode. His wife grabbed the kids and took them to the neighbor’s house where she called the police to get her husband some help. However, as is the case in so many countless other incidents, police did anything but help. After police showed up, they searched the Lewandowski’s home and found 6 tiny marijuana plants. Police then weighed all of the plant matter together and it did not total to a single ounce. However, because of Oklahoma’s draconian laws against growing a plant, Lewandowski was charged with felony marijuana cultivation. According to Whitney Lewandowski, Kristoffer’s wife, the police also pulled up their tomato plants and included them in the photo for the media. “[Police] made it look like he had this huge grow [operation] going,” Whitney said in an interview with Truth in Media. But that was not the worst of their problems. Police then cuffed Whitney and threw her in the back of a police cruiser and told her their children were being taken by Child Protective Services. They were charging her with a felony too. In order to make it look like a legitimate arrest, police told Whitney that if she pressed assault charges against her husband, they would not charge her and she could keep their children. She obviously opted to stay out of prison and to not have her children kidnapped by the state. However, while he was in the care of a Veterans Administration psychiatric hospital, Lewandowski inadvertently missed a court date. With guns drawn, and in front of all the children at his child’s daycare, undercover cops swarmed Lewandowski in a dramatic raid. This man’s life has been turned upside down. He was taken from his family, unable to see his children, and was facing the idea of spending the rest of his life behind bars — yet, he harmed no one. Because felony marijuana cultivation in Oklahoma carries a maximum sentence of life in prison, Lewandowski’s options were limited. However, Lewandowski’s legal council arranged for him to take a plea deal and he avoided jail — for the time being. This plea deal, however, came with a catch. It meant that Lewandowski was going to be a felon — instead of a veteran. His felon status impeded his health and education benefits, and greatly stifled his chances of getting a good job. So, he did something about it. As Mass Roots reports, after regretting this decision, this stand-up veteran took a big risk to clear his name. “It is absolute insanity – this situation. Putting a three tour combat Marine veteran who served his country faithfully, in jail for using a medicine, the only medicine that was effective in treating his severe PTSD. This shows the deep and disturbing problems our country faces, ” said Matthew J. Pappas, a California-based attorney who is assisting Lewandowski along with his Oklahoma attorney, Tom Hurley and Florida-based attorney, Michael Minardi. With new counsel, clearer understanding of the repercussions for the plea and a patriot’s belief in justice, he respectfully stood before Judge Tayloe and prosecutor Jordan Cabelka, and asked to reverse his plea in the crowded courtroom. Kris won that battle on October 19, with the Judge allowing a plea reversal. So, for the moment, he is a veteran and not a felon. But the state took it personally and added the assault with a deadly weapons charge and a firearms charge thrown in because he had an heirloom, replica firearm in the house at the time of the disturbance. The state gave Lewandowski three options or trial. Two included jail time, the other had no jail but wouldn’t allow for him to consume his medicine, even in a legal state. On May 30, Lewandowski will face a jury of his peers for the frivolous charges the state is using to punish him. If he is found guilty, he could face life in prison, again. “I am absolutely heartbroken that a medicine that helps me has me fighting for my legal freedom,” Lewandowski said, as reported by the Daily Haze. However, all the jury has to do is say, ‘Not Guilty,’ and it is all over. This morally innocent man can go back to his family and the state’s tyrannical war on drugs gets exposed for exactly what it is — a war on people. If you’d like to help the Lewandowski family you can do so in two ways. First, share this article, as it was media coverage that helped him escape the state’s grasp the first time. Secondly, you can go to the You Caring Page set up for his family and donate by clicking here.